In an acidic solution, permanganate(VII) is reduced to the pale pink +2 oxidation state of the manganese(II) (Mn2+) ion. 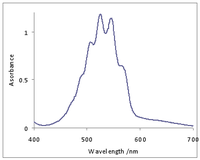 In a neutral medium, however, it gets reduced to the brown +4 oxidation state of manganese dioxide MnO2. A series of potassium permanganate solutions with varying concentration, increasing to the right. Permanganates(VII) are salts of permanganic acid. They have a deep purple colour, due to a charge transfer transition. Permanganate(VII) is a strong oxidizer, and similar to perchlorate. It is therefore in common use in qualitative analysis that involves redox reactions (permanganometry). According to theory, permanganate is strong enough to oxidize water, but this does not actually happen to any extent. Besides this, it is stable. It is a useful reagent, though with organic compounds, not very selective. Potassium permanganate is used as a disinfectant. A permanganate can oxidize an amine to a nitro compound, an alcohol to a ketone, an aldehyde to a carboxylic acid, a terminal alkene to a carboxylic acid, oxalic acid to carbon dioxide, and an alkene to a diol. This list is not exhaustive. ^ Sukalyan Dash, Sabita Patel & Bijay K. Mishra (2009). "Oxidation by permanganate: synthetic and mechanistic aspects". Tetrahedron. 65 (4): 707–739. doi:10.1016/j.tet.2008.10.038. ^ Cotton, F. Albert; Wilkinson, Geoffrey; Carlos A. Murillo; Manfred Bochmann (1999). Advanced Inorganic Chemistry (6th ed.). New York: John Wiley & Sons, Inc. p. 770. ISBN 978-0471199571. ^ Kovacs KA, Grof P, Burai L, Riedel M (2004). "Revising the Mechanism of the Permanganate/Oxalate Reaction". J. Phys. Chem. A. 108 (50): 11026. Bibcode:2004JPCA..10811026K. doi:10.1021/jp047061u.